This dataset provides environmental, soil, and vegetation data collected during the periods of August 1984 and August-September 1985 from 84 study plots at the Imnavait Creek research site. Imnavait Creek is located in a shallow basin at the foothills of the central Brooks Range. Data includes the baseline plot information for vegetation, soils, and site factors for the study plots subjectively located in 14 plant communities that occur in 19 broad habitat types across the glaciated landscape. Specific attributes include: dominant vegetation species, cover, indices, and biomass pools; soil chemistry, physical characteristics, moisture, and organic matter. This product brings together for easy reference all the available information collected from the plots that has been used for the classification, mapping, and analysis of geo-botanical factors in the Imnavait Creek region and across Alaska. Figure 1: Imnavait Creek Permanent Vegetation Plot Layout at Plot SW-58. This dataset is a summary of environmental, soil, and vegetation information collected from 84 study plots near Imnavait Creek, Alaska. Imnavait Creek is situated in a shallow basin at the foothills of the central Brooks Range and the Imnavait Creek vegetation area is located near the center of the Upper Kuparuk River region and encloses a 22-km2 area northeast of Toolik Lake, close to the southern foothills of northern Alaska. The Dalton Highway and the trans-Alaska pipeline both pass nearby. Imnavait Creek was chosen as a study site as it provides a good representation of the southern foothills of the Brooks Range, a glaciated region characterized by rolling tundra plains interspersed with hills, knobs and low ridges. Data includes the baseline plot information for vegetation, soils, and site factors for the study plots subjectively located in 14 plant communities that occur in 19 broad habitat types across the glaciated landscape. Specific attributes include: dominant vegetation species, cover, indices, and biomass pools; soil chemistry, physical characteristics, moisture, and organic matter. This product brings together for easy reference all the available information collected from the plots that has been used for the classification, mapping, and analysis of geo-botanical factors in the Imnavait Creek region and across Alaska. Imnavait_Creek_Environmental_Data.csv Comprehensive set of environmental characterization data for Imnavait Creek research plots including the descriptive site factors. Most measurement data have been processed to provide values at a common 10 cm depth. This measurement comparability facilitates analysis of geo-botanical relationships across Alaska. Note: Coded and scalar variables are followed by a description column (e.g., LANDFORM and LANDFORM_DESC). See the companion file Imnavait_Creek_Env_Legend.pdf for a complete list of coded and scalar variables and their descriptions. 4 to 87 SW01 to SW73 Column headings are all 84 plot numbers. The data values are Species Cover Classes (Braun-Blanquet cover-abundance scale): where r (rare), + (common, but less than 1 percent cover), 1 (1-5 percent), 2 (6 to 25 percent), 3 (25 to 50 percent), 4 (51 to 75 percent), 5 (76 to 100 percent). Companion Files: There are four companion files with this dataset in .pdf format. Imnavait_Creek_Plot_Photos.pdf This file contains landscape, plot, and soil photos of the Imnavait Creek vegetation plots. Imnavait_Creek_Legend.pdf This file contains the legend for the environmental parameters of the Imnavait Creek vegetation plots. These data bring together for easy reference all the available information collected from the plots and has been used for the classification, mapping and analysis of the environmental controls in the Imnavait Creek region. Derived regional maps of these data will be used in regional models of fluxes of trace gases, water, and energy from tundra surfaces and provides useful input to several phases of the R4D (Response, Resistance, Resilience and Recovery from Disturbance) research including the landscape ecology, slope modeling, and the primary productivity studies. In addition, a circumpolar vegetation classification resulting from these datasets would be highly desirable to extend the results to the entire arctic region. Imnavait Creek is situated in a shallow basin at the foothills of the central Brooks Range and the Imnavait Creek vegetation area is located near the center of the Upper Kuparuk River region and encloses a 22-km2 area northeast of Toolik Lake, close to the southern foothills of northern Alaska. The Dalton Highway and the trans-Alaska pipeline both pass nearby. The hills near Imnavait Creek rise less than 100 m from the valley bottoms to the crests, and are elongated in SSE to NNW trending ridges. The west-facing aspects of these ridges are much gentler and longer than the east-facing aspects; in fact, over 60% of the terrain has NW/SW-facing aspects. Most hill crests have till at the surface, providing rocky mineral substrate for plant communities, whereas hill slopes and valley bottoms are generally smoothly eroded and covered by colluvium and shallow peat deposits. Imnavait Creek was chosen as a study site as it provides a good representation of the southern foothills of the Brooks Range, a glaciated region characterized by rolling tundra plains interspersed with hills, knobs and low ridges. Data includes the baseline plot information for vegetation, soils, and site factors for the study plots subjectively located in 14 plant communities that occur in 19 broad habitat types across the glaciated landscape. Figure 2. Location map of the 84 Imnavait Creek Permanent Vegetation Plots. Taking photographs of the general site (Figure 1), close-up of vegetation (Figure 3), and close-up of the soil profile (Figure 4). Photos are provided in Imnavait_Creek_Veg_Plots_Report_Walker_1987.pdf and Imnavait_Creek_Plot_Photos.pdf. 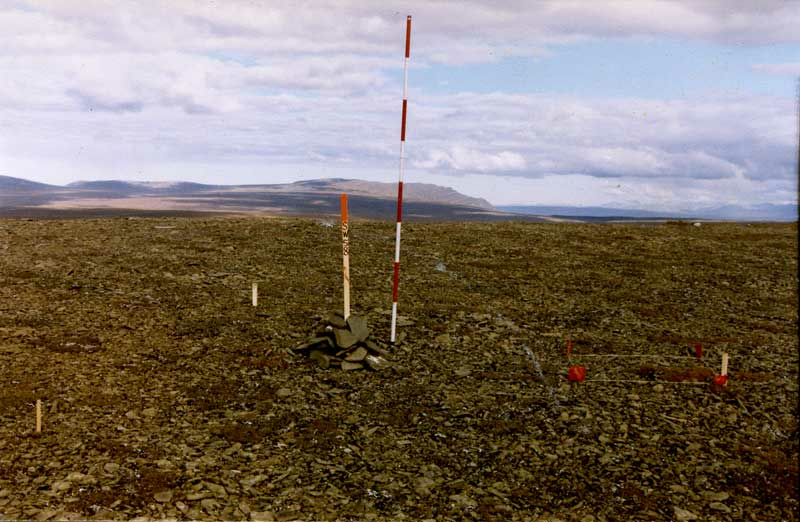 Within each permanent plot, a smaller 1-m2 photo-plot was marked for periodic close-up photos to record long-term changes due to mortality, recruitment, disturbance, or climate changes. This plot was marked with four wire flags and string around the perimeter of the plot. Field sampling of soils where soil pits were dug adjacent to the plots and described and classified according to the U.S. soil taxonomy [Walker et al., 1987]. Soil samples were collected from each horizon and air dried in the laboratory. Bulk density and soil moisture samples were taken from the sides of the soil pits or from large solid plugs for the wet soils using a 240-ml soil can. Figure 3: Vegetation at one of the Imnavait Creek permanent plots (Plot SW-15). 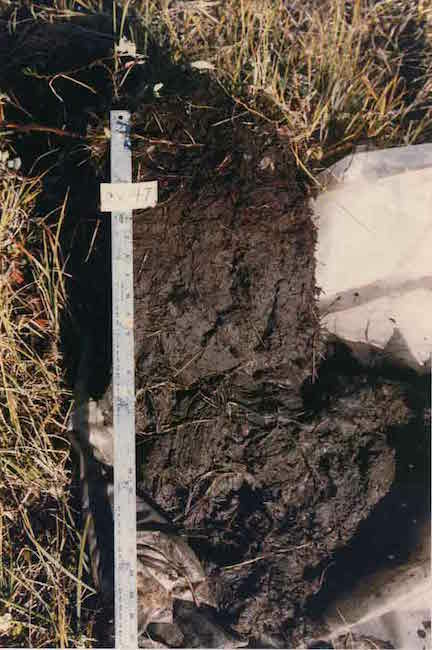 Figure 4: Soil profile at one of the Imnavait Creek permanent plots (Plot SW-47). NDVI, LAI, iPAR, and above ground biomass measurements were collected for the Imnavait Creek permanent vegetation plots. The results were published in Shippert et al. (1995) and Walker et al. (1995). Overall 3 random replicates were sampled at each plot between 25 July and 10 August 1993. These measurements are named by the suffix A, B, or C added to the plot ID. The NDVI data are derived from field spectroscopy carried out with a ASD PS-II portable field spectrometer. 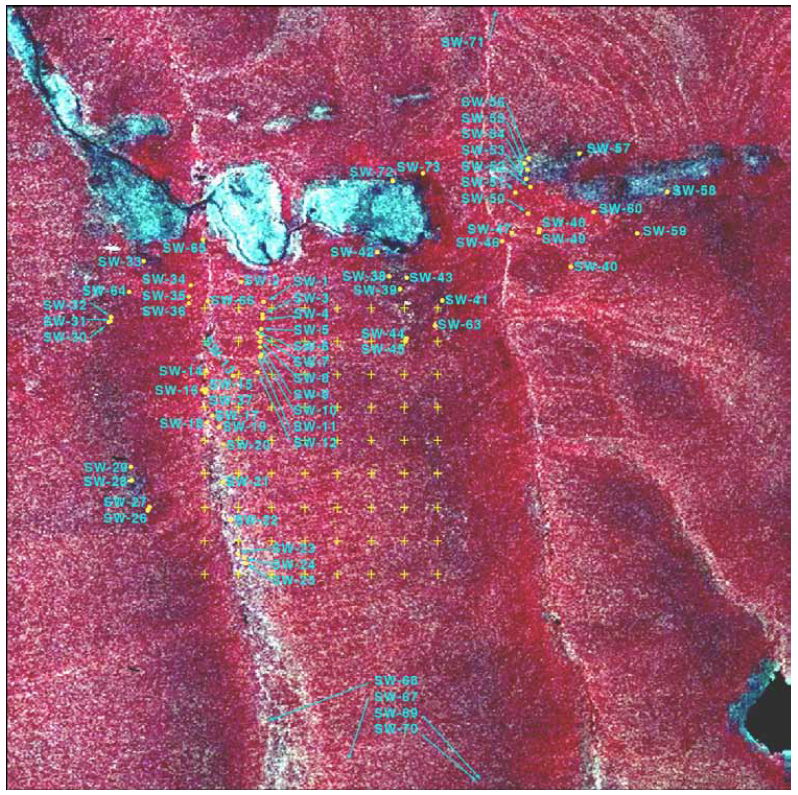 The NDVI values were calculated from reflectances at wavelengths corresponding to the Landsat TM red band (630-690 nm) and the near-infrared band (760-900 nm). The LAI was measured with a PCA-2000 plant canopy analyzer by LI-COR Inc.
IPAR was measured with a LI-1000-line quantum sensor by LI-COR Inc.
Total biomass was measured by collecting all above-ground organic material at each sample site within a 50x20 cm wire frame centered over the site of reflectance, LAI and iPAR measurements. Note that the Spectral and Biomass - Imnavait Creek Plot (IMN) numbers correspond to the Imnavait Creek plot numbers established by Walker whose field numbers begin with SW.
Shippert, M. M., D. A. Walker, N. A. Auerbach, and B. E. Lewis. 1995. Biomass and leaf-area index maps derived from SPOT images for Toolik Lake and Imnavait Creek areas, Alaska. Polar Record 31:147–154. Walker, D. A., N. A. Auerbach, and M. M. Shippert. 1995. NDVI, biomass, and landscape evolution of glaciated terrain in northern Alaska. Polar Record 31:169–178. Walker, M.D., D.A. Walker, and K.R. Everett. 1989. 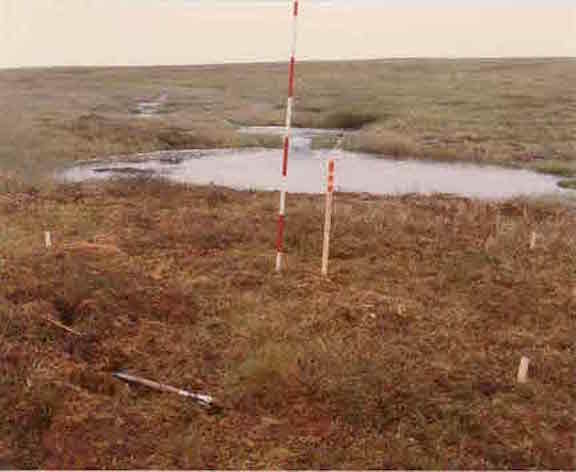 Wetland soils and vegetation, Arctic Foothills, Alaska. U.S. Fish Wildl. Serv. Biol. Rep. 89(7). 89 pp. Walker, D.A., Lederer, N.D., Walker, M.D. 1987. Permanent vegetation plots (Imnavait Creek): site factors, soil physical and chemical properties, and plant species cover. DOE R4D Program Data Report. 43 pp.